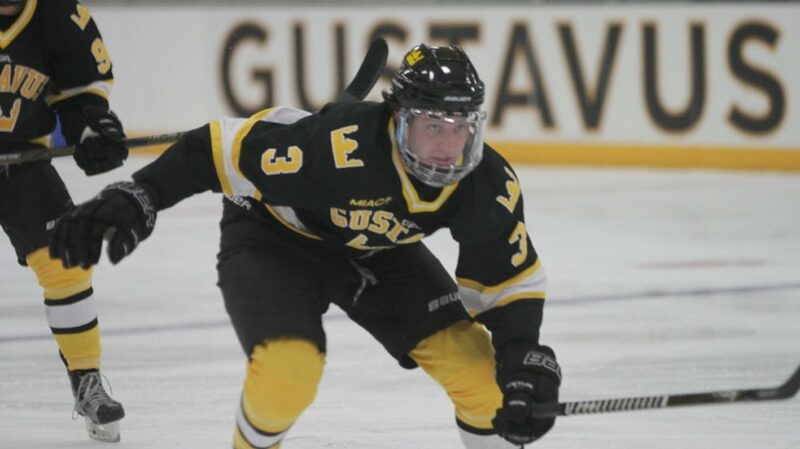 GENEVA, Ill. – The Gustavus men’s hockey team battled back from a two-goal deficit and ended up in a 3-3 stalemate Friday evening in a non-conference game at Aurora University, moving its record to 6-4-2 overall. The Gusties and the Spartans each scored three times during a busy second period after a scoreless first frame. Tyler Rock (Fy., Savage, Minn.) scored his second goal of the season on the power play two minutes into the second period with help from Will LeNeave (Fy., Medina, Minn.). The Gusties held on to their lead through the midway point of the period prior to Aurora scoring three consecutive even strength goals. Aurora got on the board at the 10:58 minute mark before scoring two more goals, only minutes apart, to take a 3-1 lead with under five minutes remaining in the second frame. A power play opportunity near the end of the period allowed Gustavus to get back into the game. The Gusties capitalized on the man advantage at 17:19 with their second power play tally of the game, as Van Sullivan (Jr., Brentwood, Tenn.) got the Black and Gold within one with his third goal of the season. Colton Schmidt (So., Eden Prairie, Minn.) and Jared Bromberg (So., Rochester, Minn.) were credited with assists. Soon after, JP Eykyn (Fy., Waseca, Minn.) scored the equalizer, his second of the season, with assists from Reid Brown (So., Superior, Colo.) and JT Walters (Sr., Escondido, Calif.). Both teams were scoreless in the third period and the overtime period. The Gusties turned away four Aurora power play chances, while going 2-for-6 on the man advantage. The Spartans held a 36-32 advantage in shots on goal. Goaltender Chris Amsden (Jr., St. Peter, Minn.) tied a season-high with 33 saves as his record moves to 4-3-1 on the season. Gustavus concludes the non-conference series against Aurora tomorrow afternoon at 3 p.m.